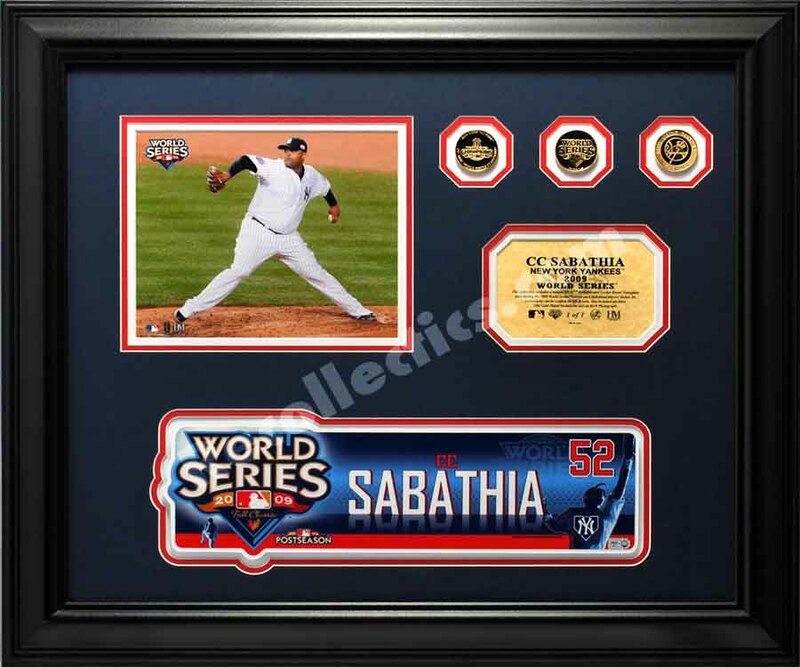 2009 World Series CC Sabathia Game-Used Locker Name Plate with MLB Hologram number LH729315. This is the actual Name Plate that hung above CC Sabathia's locker at Yankee Stadium during the 2009 World Series. The New York Yankees defeated the Philadelphia Phillies in six games. This collectible includes a unique MLB Authenticated Locker Room Name Plate used in the Yankee Stadium clubhouse during the 2009 World Series. Its authenticity can be verified on MLB.com. Also included in the frame are three 24kt Gold Plated Medallions and a photograph. This item is limited to 1 of 1. Separate name plates were produced for the games in Philadelphia.